A System Reserved partition is a Windows partition that is created when you clean install Windows 7/8/10. This partition contains necessary files to start your computer. It stores the boot configuration and boot manager data. Whenever you start your computer the boot manager gets started and reads the boot data from this partition. The bootloader is booted which starts the Windows OS from the main system drive. Another use of System Reserved partition is with BitLocker drive encryption. If you want to use the BitLocker drive encryption then it can only be done with a System Reserved partition as it will contain necessary files to load the encrypted system drive. The System Reserved partition acquires 100 MB space on Windows 7, 350 MB on Windows 8, and 500 MB on Windows 10. The main problem with this partition is that it can't be extended easily. Whenever you try to extend it in the disk management console then you will find that the 'Extend' option is greyed out. So why there is a need to extend the System Reserved partition. Yes, there is a need to do this if you are upgrading your PC/laptop from Windows 7/8 to Windows 10. 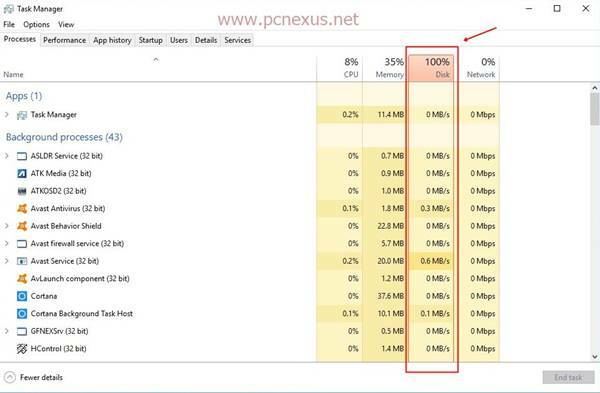 Since these former versions of Windows require 100 MB and 350 MB space as reserved then Windows 10 installation may fail because of low reserved space because it requires at least 500 MB. A common error can be seen while upgrading to Windows 10 as "We couldn’t update the system reserved partition." This happens due to low space in the System Reserved partition. So if you are upgrading from Windows 7/8 to Windows 10 then before upgrading extend your PCs System Reserved partition to at least 500 MB. In this tutorial we will teach you how you can do this safely without any error or data loss. You can also read, upgrade to Windows 10 for free in 2017. To be on a safe side first of all backup your data on an external drive. You can also create an image of C:\ drive using the EaseUS Todo backup software. If anything goes wrong then you can restore your PC back to its normal state. We are sure that this tutorial that we are going to tell you won't result in any error or data loss. But still it is a good idea to have backup of your precious data on an external drive. Open it and click 'MiniTool Partition Wizard Free' on the welcome screen. Here find the 'System Reserved' partiton. Right click on it to select 'Extend' or first select it then click 'Extend Partition' in the left option's pane. Now a popup will open asking you to select the required space for the System Reserved partition. Make sure to drag the slider towards left so that the total space gets only 500 MB. Don't make the partition bigger than 700 MB as there is no use of making this partition spacious beyond the accepted limit. Now select the Drive from which you want to take space to allocate to the System Reserved partition. You can select C:\, D:\, or E:\ or whatever partition you have. Make sure you have backup of this donor partition. Now after selecting the space and the donor drive click 'OK'. Now click the 'Apply' button on the top left corner to start the extend partition operation. Wait for few minutes and do not cancel the process at any cost. You will be notified when the operation gets finished. Now open disk management console and check the space of the System Reserved partition. It will be greater than 500 MB. To open disk management console, open command prompt and type 'diskmgmt' without single quotes. So you have successfully extended a System Reserved partition. Now you can safely upgrade a Windows 7/8 computer to Windows 10 without getting any partition updating error. If you have any questions then ask via comments and if you liked this article then do take two minutes to share it. Video Editing is just like a tough science subject for many. The reason being the unavailability of reliable and easy to use video editors. I am not saying that there aren’t good video editors available. But most of the video editors available today are either very expensive or hard to use. And some of them are built for professionals only. So beginners in the field of video editing always keep a distance from these video editing software. To overcome these difficulties Movavi developed a video editing software which is easy to use, versatile, and affordable. 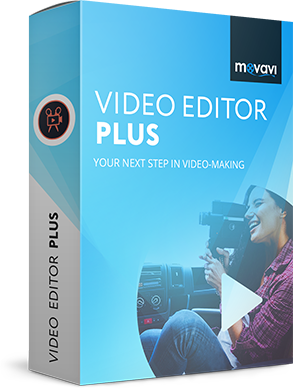 This software is Movavi Video Editor 15 Plus which has just been released as the latest and new version. The Movavi is good for beginners and even professionals. 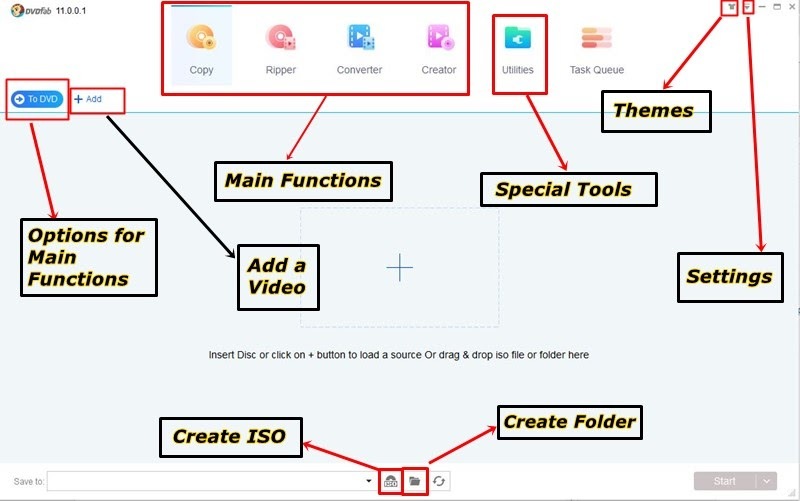 With this software, anyone can edit his/her videos with ease. This is the only nice and easy to use video editor that you will love to use. 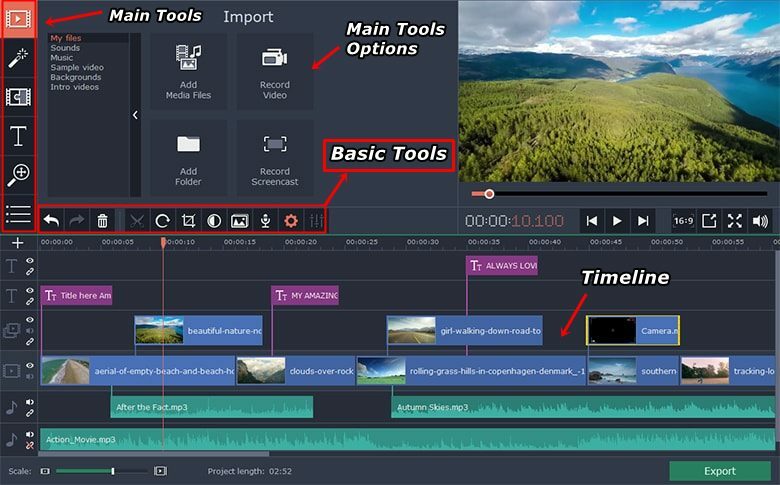 This software is highly recommended to YouTube video creators, video producers, video editing professionals, and people who want to edit their videos just for any purpose. Movavi Video Editing Software is available to download on Mac and Windows 10 and older Windows operating systems are also supported. This software comes with a 7-day trial period so that you can test it and later decide to buy. Is Movavi Video Editor 15 Plus Safe? Yes, Movavi Video Editor 15 Plus is free from any malware, adware, trojans, or spyware. This software product is 100 percent virus free. Movavi is a trusted name for multimedia software since 2004. So you can download and install this software without any worries. But only download from their official website link which is given above. Contains a lot of filters and transitions that you can apply to a video. You can also purchase effects from the effects store. Lets you combine two videos for a side-by-side video playing. It is also known as a picture in picture video. Supports all popular video formats including 4K formats. Use object animation to make your own animation. Use chroma key or green screen removal to change the background of a video. Add new tracks and change their order in the video timeline. Highly useful for YouTube video creators. 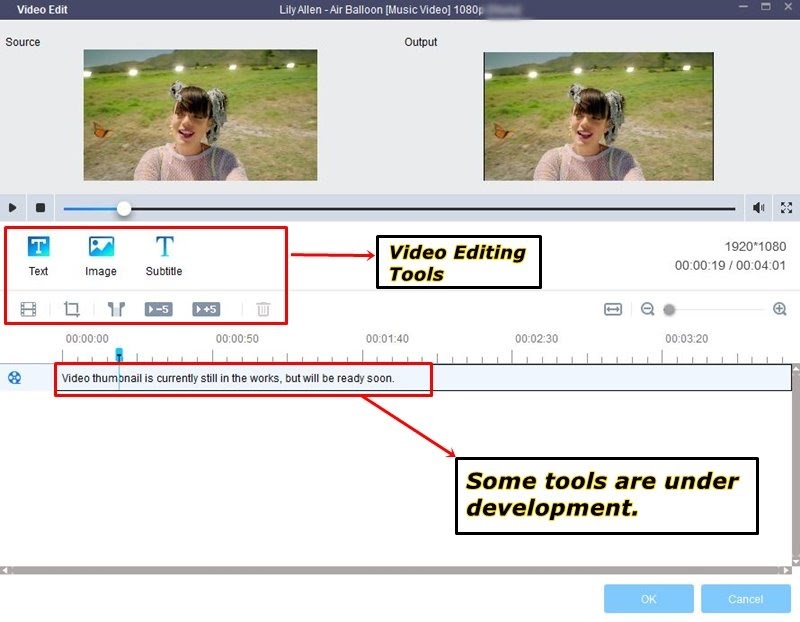 Here is a screenshot explaining the UI details of Movavi Video Editor 15 Plus. There are four tools that are fixed and the fifth one is replaceable using the hamburger menu. The first option is for importing the media files like audio, video, and pictures. The second option with a magic wand is for the filters. The third option gives access to the transitions. And the fourth one is customizable you can click the menu icon below the fourth option and select any one option from the list that you want to use the most during video editing. These options include ‘callouts’, ‘pan and zoom’, ‘stabilization’, ‘highlight and conceal’, and ‘chroma key’. Check out the explanation for basic video tools below. Open the video editor and load a video or simply drag and drop the video on to the timeline. When the video is added it will be visible on the timeline and you can see the video and audio on the timeline. Below the video, the long bar with waveforms is the audio. You can completely delete this audio if you want to mute the video. You can also add another audio file and drag it over to the video to match its entire length. So, the audio will be played from video’s start to the end. Click the ‘Filters’ button and select the filter you want to apply. You can apply multiple filters. Then check out the transitions and see if you want to apply any transition effect anywhere in the video. Click the ‘Titles’ button and use the text templates to create the intros or end credits for your videos. Titles can be applied anywhere in the video. Clicking the hamburger menu you can access functions like ‘highligh and conceal’, ‘chroma key’, ‘Callouts’, ‘stabilization’, and ‘animation’. Above the video timeline you can access basic tools like cut, crop, rotate, audio properties, and video properties. Check the basic video tools above. After editing the video you can export to any video format. Once you finish editing the video just click the ‘EXPORT’ button. A video export dialog will open up. Select any format in which you want to export your video. Click the ‘Advanced’ button to change the resolution, codec, frame rate, bit-rate, and audio channels. After selecting the format and quality click the ‘Start’ button. The conversion will take time according to your project length and will depend on the processing speed of your CPU. These are the minimum system requirements for Movavi Video Editor 15 Plus. Operating system: Microsoft Windows XP/Vista/7/8/10 with up-to-date patches and service packs installed. Processor: Intel, AMD, or compatible dual-core processor, 1.5 GHz or above. Graphics card: Intel HD Graphics 2000, NVIDIA GeForce series 8 and 8M, Quadro FX 4800, Quadro FX 5600, AMD Radeon R600, Mobility Radeon HD 4330, Mobility FirePro series, Radeon R5 M230 or higher graphics card with up-to-date drivers. Display: 1280 × 768 screen resolution, 32-bit color. RAM: 512 MB RAM for Windows XP and Windows Vista, 2 GB for Windows 7, Windows 8, and Windows 10. Hard drive space: 800 MB available hard disk space for installation, 500 MB for ongoing operations. Overall Movavi Video Editor 15 Plus is a nice video editor especially suited for YouTube creators which require a cheap and reliable video editor. There are lots of filters and transition effects. The object animation feature is very good at what it says. You have the option to test it completely for 7 days before purchasing it. Nearly two years ago we did review the DVDFab 10. Now today we're going to review its 11th installment which came as DVDFab 11 with completely redesigned and flat UI. DVDFab is among us for a long time now (since 2003) and years of trust and development have led this product to come so far. Just like DVDFab 10, DVDFab 11 is an all in one suite for all your DVD and Blu-ray needs. If you want to copy, rip, create, or convert a DVD/Blu-ray media then DVDFab 11 is the ultimate tool for you. Before getting to the review you should know what DVDFab 11 actually is and what it does? DVDFab 11 is an all in one DVD, Blu-ray and UHD solution which can copy, rip, convert, and create DVDs, Blu-rays, and UHD discs. It also provides various free tools like YouTube video downloader with which you can download YouTube videos in high resolution and HD decrypter for decrypting discs. If you use DVDFab 11 then you can use all the tools like copy, ripper, and converter through a single software window. It is a very nice software that can convert any physical disc into an ISO or a folder. It is also known for removing disc encryption and supports decryption of the major disc encryption techniques. If you ever need an all-in-one DVD, Blu-ray, UHD solution then DVDFab is the only answer. What's New in DVDFab 11? All new plain, flat, and simple design. DVDFab 11 introduced a wireless connectivity feature. You can now connect your smartphone to DVDFab 11 via DVDFab remote with Wi-Fi. Through this feature, you can directly transfer data to your PC from your phone and can also pick up videos to convert them in the DVDFab 11 video converter. The video converter function has now a new special format for YouTube videos which is added as 'Web Optimized'. So if you are converting videos for your YouTube channel this new feature will amaze you. A new 'File Transfer' tool can be found in 'Utilities'. The transfer requires a Wi-Fi connection and DVDFab remote app which should be installed on your Android or iOS device. Now supports nearly 1200+ input and output video formats. Have a look at the main UI of DVDFab 11. You can see that all the major functions are accessible from the main window. DVDFab 11 provides four main functions for DVD and Blu-ray operations which are the copy, rip, convert, and create a DVD or Blu-ray. The 'Utilities' tab provides some free tools like BDinfo, BDfix, YouTube video downloader, and file transfer. Clicking the 'Task Queue' will show you the active threads running. You can directly save a DVD or Blu-ray disc as an ISO or a folder from the main window. Just check out the dedicated 'ISO', and the folder buttons below. DVDFab 11 provides four main functions which are being described in detail below. The explanation of these functions will tell you why it is good to call DVDFab 11 an all in one DVD and Blu-ray suite. The copy function simply lets you copy a DVD or Blu-ray disc to another blank DVD or Blu-ray disc, ISO, or a folder. If you want to save a copy of your physical disc then ISO would be the best choice. The copy function has various sub-functions which are listed below. Full Disc: Copy the entire DVD/BD to a new blank disc, ISO, or folder. This makes an exact replica of your physical disc. Main Movie: The sub-function only selects the main movie from the disc and copies it to new blank disc, ISO, or a folder. You are allowed to select other main movie titles instead of keeping the one which is selected by default. Customize: The customize sub-copy function lets you select multiple movie files on the disc. You can choose which movie titles to select and which to skip. After that, you can copy those movie files to a new blank disc, ISO, or a folder. Split: The split function lets you split a DVD9 into two DVD5. Merge: With the merge function, you can merge multiple DVDs and Blu-rays into a single disc. But both disc types can't be mixed. Clone/Burn: If you want to make a 1:1 lossless copy of your DVD or BD then use this function to create a lossless ISO, folder or even burn the copied disc data to a new blank physical disc with the DVDFab burning engine. ToDVD: If you want to copy and convert a Blu-ray to a DVD format then use this function. This function only supports normal Blu-ray discs, ISO, and folders and doesn't support UHD. ToBlu-ray: If you want to copy and convert a DVD to a Blu-ray format then use this function to create a new disc, ISO, or a folder. UHD to Blu-ray: UHD Blu-ray discs are actually 4K BD100 discs. They are known to deliver the ultimate 4K UHD experience on a 4K screen. These discs can't be played on normal BD players. But you can convert these UHD discs to standard Blu-ray format by using the UHD to Blu-ray sub-copy function. Here again, you are allowed to burn a blank BD or create an ISO or a folder. If you know what video converting is then you should also be aware of disc ripping. In video conversion, we use video files that are stored on any type of storage media like a disc, flash drive, hard drive, or external hard drive. But in ripping we only use a physical DVD/Blu-ray, ISO, or a folder. The ripper function converts the disc media to other popular video formats like MP4, AVI, FLV, MKV etc. If you don't own a physical DVD or Blu-ray player in your home then you can use this DVDFab ripper function to actually convert your discs to popular video formats like MP4. MP4 format is highly portable and is mostly used for smartphones, TVs and media players. So if you manage to convert your disc media to MP4 format then you can play it on almost every device that you have like TV, smartphone, tablet, PC, STB, or media players. DVDFab 11 also gives you an option to rip and convert your DVD or Blu-ray disc to a smartphone, tablet, and gaming consoles formats. This is known as device-specific disc ripping, which means that you're actually ripping your physical disc media that would be easily played on your smartphone or gaming console. The device specific conversion features a lot of devices like the iOS devices, Samsung smartphones, gaming consoles like PS4, PS3, XBOX One, XBOX 360, VR headsets and many more. You just have to select the device and DVDFab 11 will automatically load the best ripping and conversion settings for your device. However, you are allowed to customize the settings before you can start to rip the disc. DVDFab converter function is exactly the same as DVDFab ripper function. The only difference is that in converter function you can use any type of video format instead of just using the DVD and Blu-ray formats. The converter function can easily convert any video format to other video formats. So it is quite possible to convert an MP4 video to an MKV video. You just simply have to select the video and then have to select your favorite output video format. You are also allowed to customize video settings like resolution, quality, audio, bit-rate etc. This converter function also supports device-specific conversion a feature which we have already explained above. The ripper and the converter functions are nearly the same. The creator function gives you the authority to create your own DVDs, Blu-rays, and UHDs. 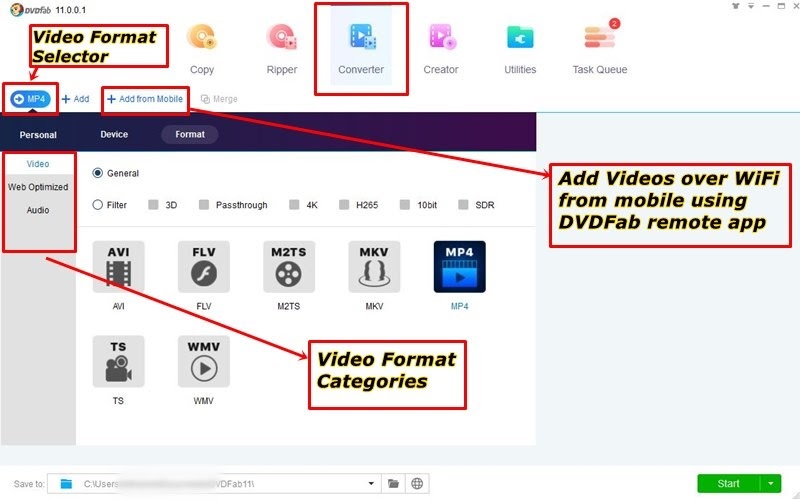 Simply select your own videos in any format and head over to the creator function. Select either DVD, Blu-ray, or UHD that you want to create. The program also lets you create disc menus and you can also select disc configuration. 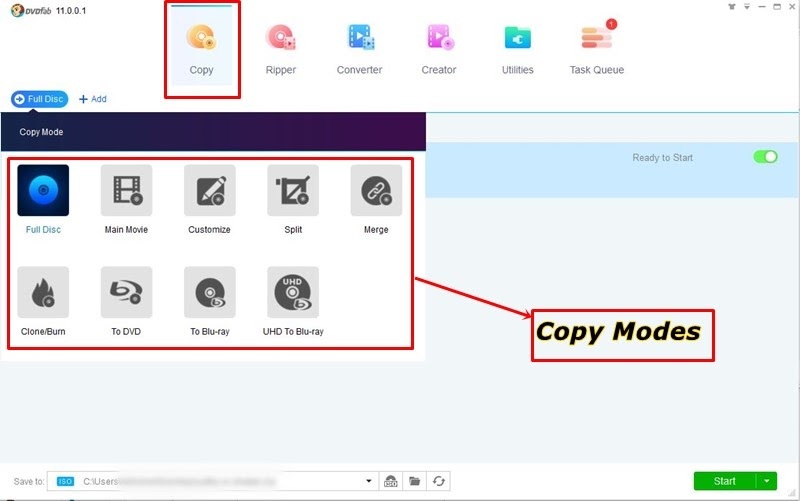 If you are using the copy, ripper, or converter function then there are some common options that you can customize. These common options are 'Chapter select', 'Audio select', 'Subtitle select' and 'Video settings'. 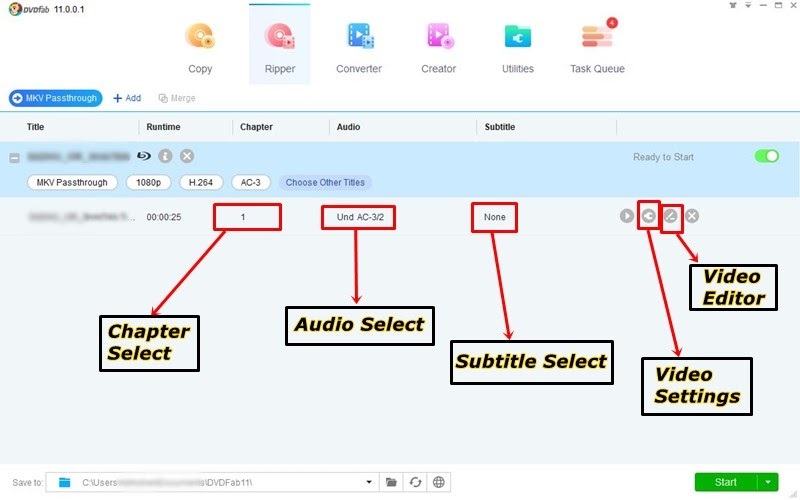 A DVD or a Blu-ray disc has multiple chapters and you can select or specific chapters while skipping the rest while using any of the three main DVDFab functions. Many DVDs and Blu-ray discs feature multiple audio streams or languages that you can select while playing them on your player. 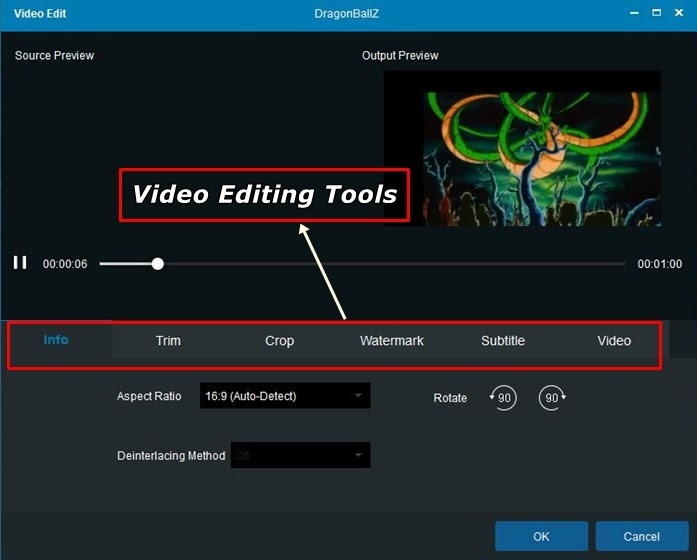 While using any of the three main DVDFab functions you can select multiple audio streams and skip those unwanted audio streams to speed up the copy, rip, or convert functions. And lastly, you can also select subtitles while using any of the three main DVDFab functions. These three options will be present in all these three main functions. 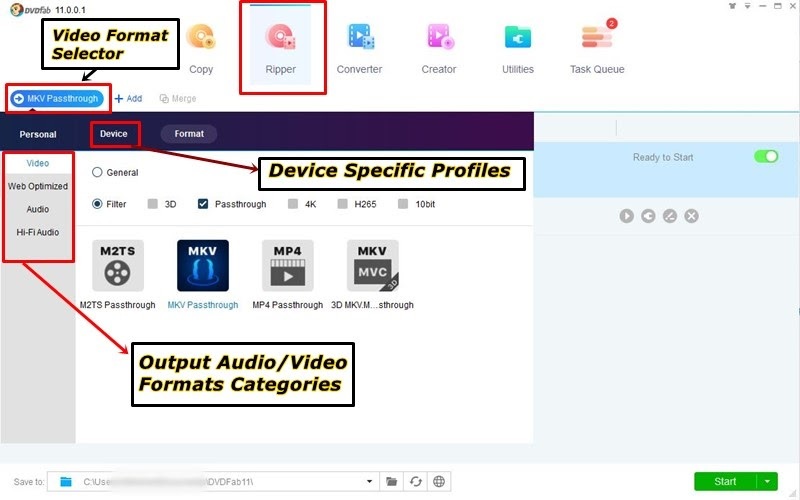 You can use the DVDFab video editor while using the ripper and the converter function. The DVDFab video editor is a set of video editing tools that can be used to edit any movie or video while ripping or converting process. The video editor provides tools like trim, crop, thumbnail, image and text watermark, and adding subtitles. The new video editor in DVDFab 11 is not as great as it was in DVDFab 10 which was easy and straightforward. You can check images from both versions. However, I believe that upcoming updates will surely gonna fix this. In this era who doesn't use YouTube? Almost every smartphone user uses YouTube to watch HD videos. And many people want to download those videos so that they can play them on their multimedia devices. For downloading YouTube videos DVDFab 11 provides a special free tool as YouTube video downloader. This tiny software is itself a YouTube browser which plays YouTube videos and gives options to download them in multiple resolutions. You can download YouTube videos and can directly send the downloaded videos to video converter and convert them to other formats and use the video editor to edit those videos. It works with 32-bit DVDFab 11 only. Here are some non-free tools that DVDFab 11 provides. Though these tools are non-free they are actually very useful and handy. These tools are listed below and can be found in 'Utilities' tab. 1. iOS Screen Recorder: Record your iPhone screen with a built-in video editor. 2. DRM Removal for Apple: Apple iTunes content uses Fairplay DRM to lock the content to their devices only. iTunes users can't view this content on any other device. To make this happen one has to remove Apple's DRM and DVDFab DRM removal for Apple is very good at it. 3. YouTube to MP3: Download your favorite YouTube videos as MP3 songs. You can also download the entire playlist at once. To use this feature you will need an application named DVDFab remote and a WiFi network. 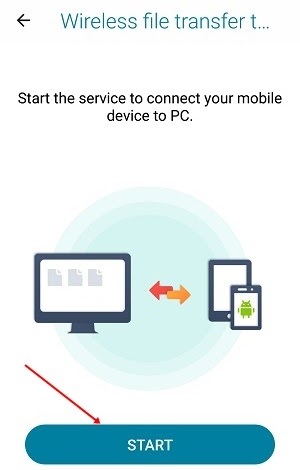 Just connect your PC and your smartphone to the same WiFi network. The DVDFab 11 program will ask you to scan a QR code through your app to wirelessly share videos between PC and the smartphone. This is a new feature and eliminates the use of data cables. Now there is no need to make a wired connection between your PC and phone to transfer videos for conversion. Just use the app and avail its wireless features. Any software which processes videos and discs is useless if it doesn't employ Nvidia CUDA, Intel Quick Sync, and AMD acceleration. These three technologies are known to boost video processing by many folds. 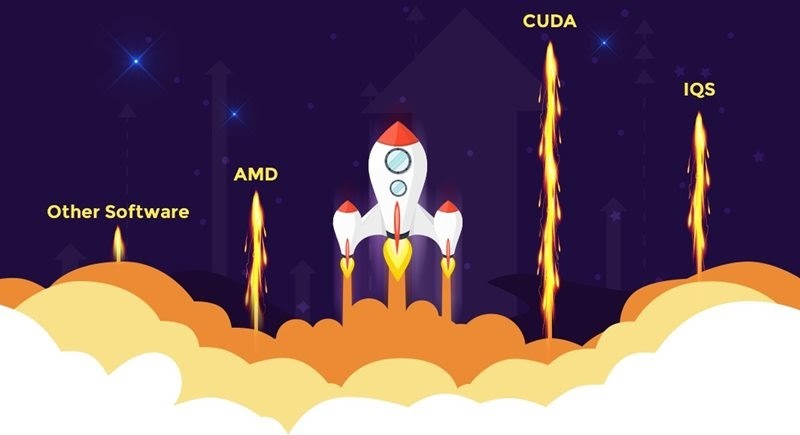 If your PC hardware comprises of an Intel Core i7 processor and a Nvidia GeForce GTX 10 series and above graphics cards then these technologies are auto-unlocked for you. With these technologies DVDFab 11 performance quite fast on a supported computer hardware. And finally, the video processing time will be quite less as compared to normal DVD or Blu-ray suites. A 20-in-1 solution for all your DVD, Blu-ray, UHD copy, ripping and converting needs. Easy to use, secure and gets timely updates. The best solution for DVD, Blu-ray and UHD discs. An easy software to create your physical discs into ISOs or folders. Has special tools for YouTube video and Audio. Unmatched fast performance on Nvidia GeForce GTX 10 or above graphics cards with Nvidia CUDA and Intel Quick Sync technology. Comes with a 30-day fully functional trial period. The copy function is versatile and provides many options to choose from. The copy functions fulfill all types of DVD or Blu-ray copy needs. So this is the DVDFab 11 review which covered its important details. If you want to dive deep into this software then the best thing would be to download and install DVDFab 11 it and then use it yourself. If this is your first-time install then you'll be granted a 30-day trial period in which most of the software features are fully functional. So what are you waiting for download it and start using it? Android screen recording is a wonderful feature for Android smartphones. A few years ago Android screen recording wasn't that easy. Because at that time the Android screen recording feature wanted your phone to be rooted. So, it was a very complex process as first you have to root your phone and then had to find a suitable Android screen recording app. 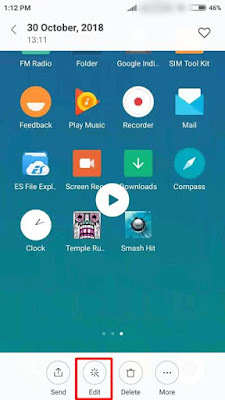 But since the launch of Android 5.0 Lollipop, we do have Android screen recording apps that don't require your phone to be rooted. You can record your Android phone screen with quality apps like AZ screen recorder. 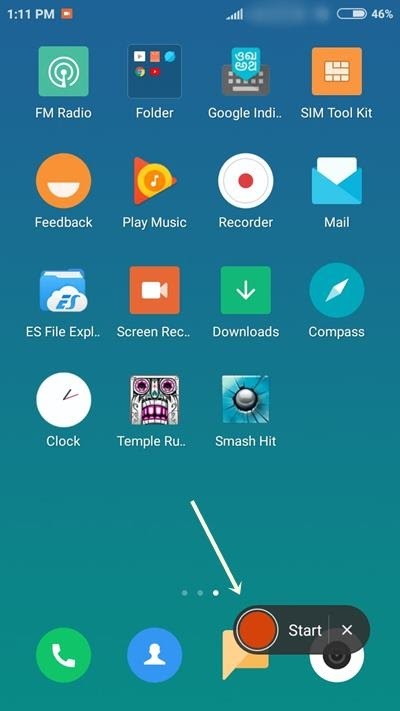 Now you can use your non-rooted phone to record its screen for gameplay and making tutorials. So it is quite a wonderful feature. Following this trend smartphone company like Xiaomi has started pushing a screen recording feature update in its smartphones. 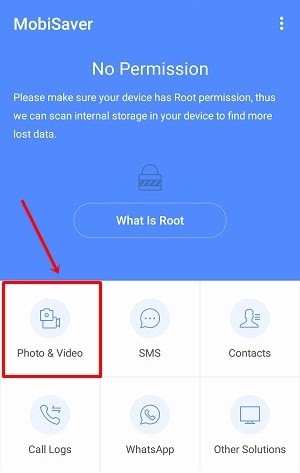 If you own a Xiaomi phone which is running MIUI 8.0 or above then you can use the hidden screen recording feature on it. 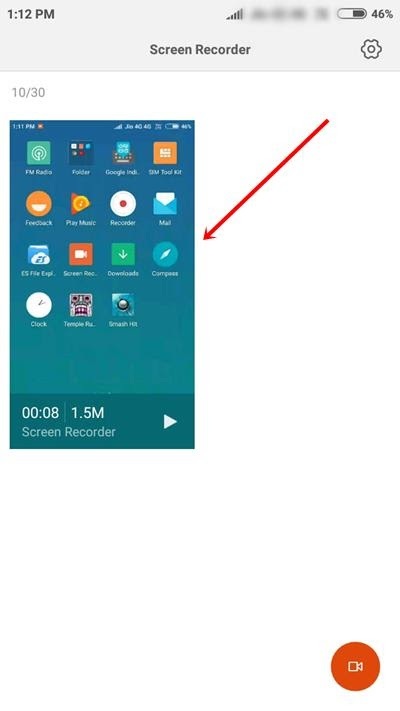 There is a reason why I am calling this a hidden screen recorder in Xiaomi phones. 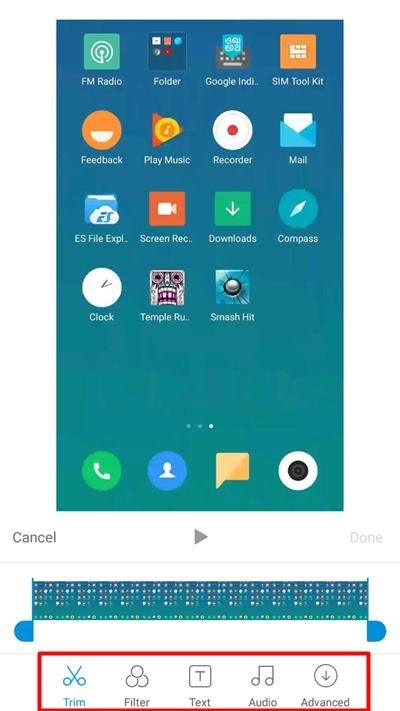 This is because the MIUI screen recorder is available in 'Tools' folder and is not visible among apps by default. 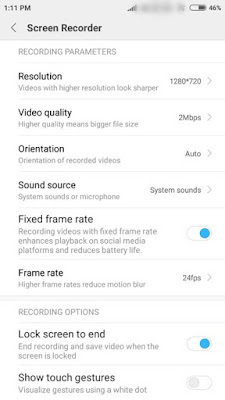 So Xiaomi phone users you don't need to install a third-party Android screen recorder because your phone has it already, but it's a basic one. On your phone go to the 'Tools' folder and tap 'Screen Recorder' app. The app will open. Tap the 'Settings' button in the top right corner. Tap 'Resolution' and select your desired higher or lower resolution. Then tap 'Video quality' and select the desired quality. Set the 'Orientation' to 'Auto'. In 'Sound Source' select MIC if you want to record your own voice. Otherwise, select 'System sounds' if you want to record internal audio. In Android internal audio recording, the MIC will be disabled. Check the 'Frame Rate' options if you want to customize them or leave the default settings. Scroll down and enable touch gestures if you want to show your viewers on where you are touching the screen. After changing all the settings go to the main screen and tap the red 'Recording' button in the bottom left corner. On tapping that red button the app will exit to apps home screen and you will see again see a red round recording button with a 'Start' label. 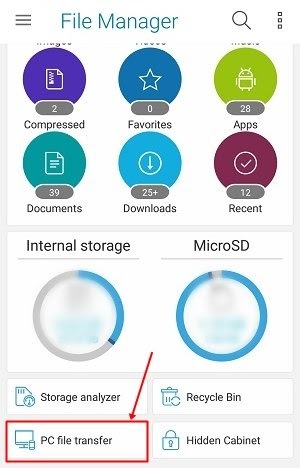 Tap 'Start' to start recording your Xiaomi phone's screen. The recording button will show the time and you can drag and drop it anywhere on the screen. When you want to finish you can tap the red stop button. The recorded video will be saved. Go to the same screen recording app in 'Tools' and the recorded video will be there. You can play that video in the media player, share it, and upload on YouTube. 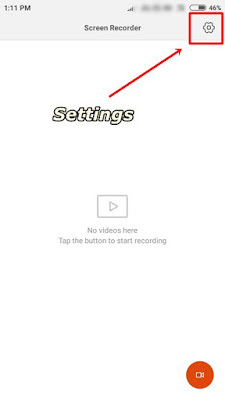 Tap any recorded video to open the options for it. Then tap the 'Edit' button. 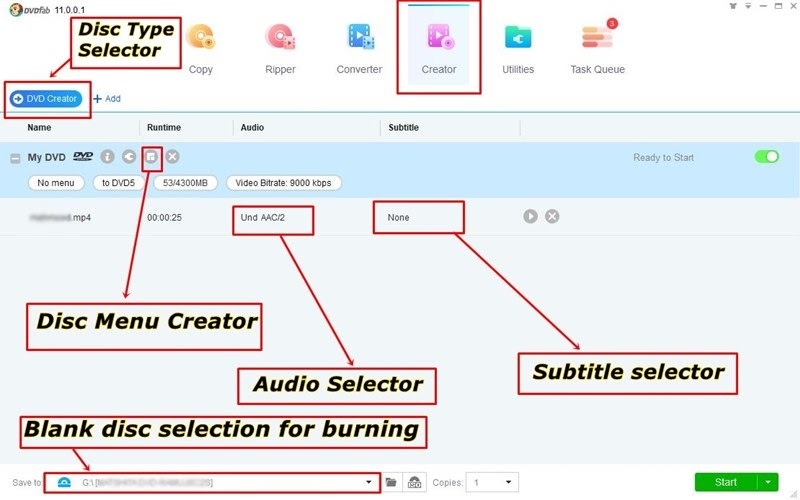 The MIUI screen recorder also provides a tiny built-in video editor which lets you edit your recorded screen videos. Tapping the 'Edit' button will open a tiny video editor. You'll have options like 'Trim', 'Filter', 'Text', and 'Audio'. With these editing options, you can add background music to your video. Add text watermark, add video filter and can trim unwanted parts of the video. What is Android Internal Audio Recording? Suppose you are playing a game on your Android. The game has audio which you hear from the speaker. This sound comes from within the game's audio files. 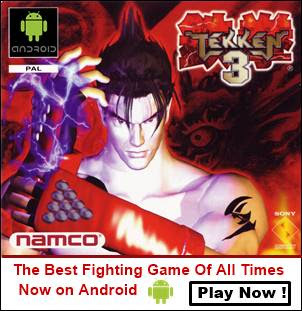 If you want to record this game with its sound then we will call it Android internal audio recording. This type of recording doesn't use the phone's MIC that's why it is always free from external sounds and noises. Currently, third-party Android screen recording apps don't support internal audio recording. But the MIUI screen recorder is fully capable of recording internal Android audio. 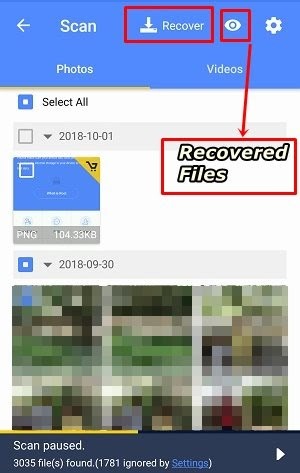 If you own a non-Xiaomi phone and want to clearly record internal audio while screen recording then check this detailed tutorial. A Twitter user SandboxEscaper just found a new zero-day vulnerability in Windows 10. The Twitter user also posted a proof-of-concept on their Github which tested and verified by US-CERT. Microsoft is aware of this vulnerability and is currently planning to a release a patch on its Patch Tuesday cycle on September 11, 2018. But currently, there is no fix to this vulnerability. The vulnerability becomes active if a hacker is able to exploit the Advanced Local Procedure Call (ALPC) system. It allows a hacker to gain the system access as an administrator on a vulnerable Windows 10 64-bit PC or a Windows Server 2016. Some experts believe that for this vulnerability to exploit a PC it should gain local access first. It is not easy for a hacker to gain local access to your computer. 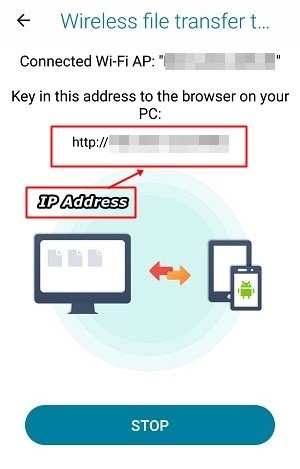 For this purpose, a hacker will try many phishing tricks with you or trick you to install a custom developed malware which lets him/her local access on your Windows 10 PC. Therefore the risk and threat level of this zero-day vulnerability are pretty low. As long as you stay vigilant about your network and PC security hackers will have a hard time targeting you. As there is no patch available for this zero-day vulnerability, therefore, you can just prevent it until Microsoft releases a patch for this. Install a good antivirus on your Windows 10 computer. Don’t just rely on free antivirus software. We highly recommend you Avast Internet Security 2018. Even if you don’t want to buy it then you can use its fully functional 30 days trial period to protect your PC until 11th September 2018. On or after this date Microsoft will release an update. Update Windows 10 and install any pending updates. Keep Windows 10 updated in all situations. I don’t know whether SMB has any relation with it but you can disable port 445 SMB to be on a safe side and to prevent ransomware attacks. Do not reply to suspicious emails, emails that ask you to download and install any files. Simply delete those emails which contain an executable (.exe) attachment. Do not click any unknown links in suspicious emails. Use a good quality VPN like ExpressVPN to hide your network activity. Do not download and install software from unknown sources. 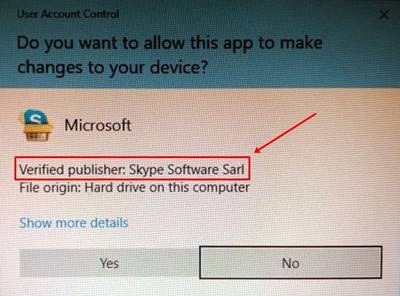 And always verify the software publisher before installing a software. So just wait for the official patch from Microsoft for this Zero Day Vulnerability and in the meantime follow the tips above to safeguard your Windows 10 PC. If you are a user of Windows Insider Programme then you may already have started getting the Windows 10 Redstone 5 preview. Windows 10 Redstone 5 is the upcoming major update to Windows 10. It is currently in testing phase and will be released to the general public in October 2018 as Windows 10 October 2018 Update Build 17746. The Windows 10 Redstone 5 will be coming with great new features and enhancements. So if you can't wait till October then you should install it right now for free. This is the first time when Microsoft released the ISO files of Windows Insider previews officially. 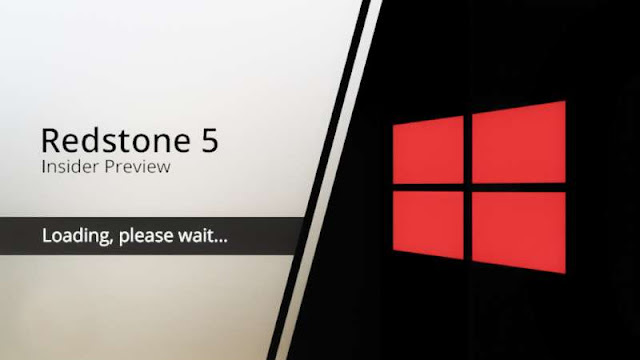 However, a normal user is barred from downloading the Windows 10 Redstone 5 ISO. At present only a Windows Insider Programme can download it. Also, make sure that Windows Insider Previews aren't stable and come with unfinished features. So your system may crash or show you BSODs. So if you are going to download and install the Windows 10 Redstone 5 ISO then make sure that you have a proper backup of your precious data. Here is a quick tutorial for downloading the Windows 10 Redstone 5 ISO. 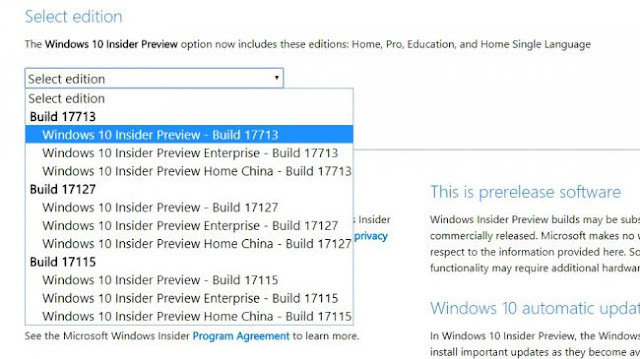 Go to 'Settings>Update & Security>Windows Insider Programme'. Click 'Get started' and follow the on-screen instructions to link a Microsoft account. Select ‘Just send me early updates’, when it appears and then click ‘Confirm’. You will be prompted to restart your computer after this. Now go to this Windows Insider Redstone 5 ISO Download link. Sign in with your Microsoft account and then wait for few seconds. Now scroll down a little bit and click the dropdown which states 'Select edition'. Select Windows 10 Insider Preview - Build 17713. Click 'Confirm' and then select 'Language'. Then again click 'Confirm'. If you see links to Windows 10 Redstone 5 64-bit ISO or Windows 10 Redstone 5 32-bit ISO then download accordingly. The ISO weighs 4.6GB in size so you'll need fast internet or Wi-Fi to download this ISO. Note: If you want to download regular Windows 10 ISO then see this tutorial. After downloading the ISO you'll need to create a bootable USB so that you can install it on your PC. To make a bootable USB you can use Rufus software. If your computer supports UEFI then make the bootable USB with GPT support. Here are some useful tutorials for you.